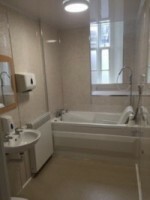 We have renovated our assisted bathrooms, upgraded to power and manual assisted hoists for easy to use bathing solutions. The powered transfer seat and variable-height adjustment on the bath means carers will not need to manually lift residents in and out of the bath. The latest bathing solutions for more independent residents. Designed baths with powered transfer seat that can be operated with easily by the carers. STAFF VACANCIES We currently have the following vacancies: Staff Nurse…..
We currently have 1 bed available. This bed is in….. Copyright © 2012 Claremont Park Nursing home. All Rights Reserved.